Kitchen sink drains, tail piece extensions, and traps are 1-1/2" in diameter. A kitchen sink drain ties two sinks together draining into one trap adapter outlet. 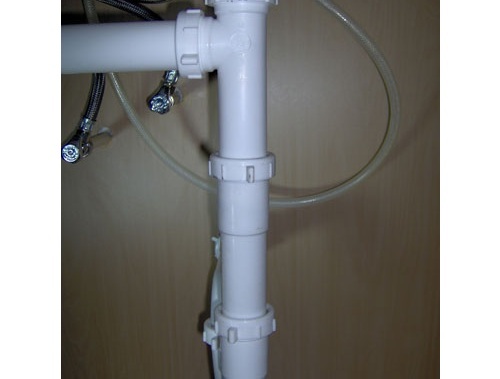 The part used for tieing the drains together is a slip-joint end(or center) outlet waste drain". 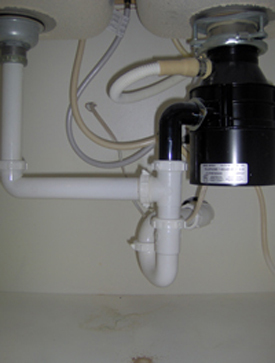 A "slip-joint end outlet waste drain" ties a double bowl sink together and the outlet is at either end of the drain. A "slip-joint center outlet waste drain", the outlet is in the middle between the two sinks. There are two materials that plumbing drains and traps are made of, and these would be plastic and light gauge steel. 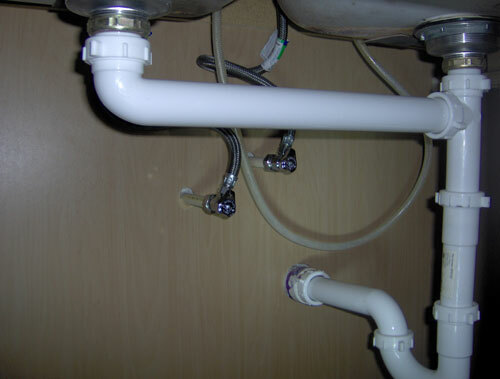 The tools required for installing kitchen sink drain slip-joint end(or center) outlet waste drain are a pair of channel-lock pliers and some plumbers pipe dope. The pictures below show a 6 inch extension between the "end outlet drain" and the trap. 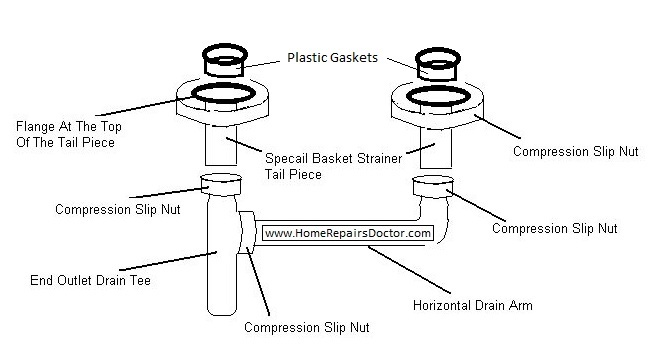 Apply pipe dope to the top and bottom side of the lip of the plastic gaskets, insert the plastic gaskets into the end of tail pieces where the tail piece connects to the basket strainer. Install the tail pieces onto the basket strainers being careful not to over tighten the slip nut. Insert a slip nut with the threads facing down onto both tail pieces, under the slip nut insert a plastic ferrule over the tail piece which will hold the slip nut in position till you finsh making the rest of the connections. Apply Pipe dope around the top outer rim of the slip joint connection of the drain tee. Install the drain tee onto the tail piece that is closest to the drain outlet in the wall and hand tighten the slip nut. 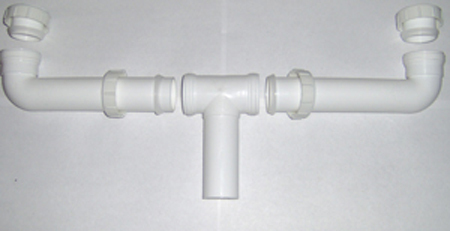 Apply Pipe dope around the outer rim of the slip joint connection of the drain tee and the drain arm slip joint connections. Install the connecting drain arm inserting in onto the remaining tail piece and into the drain tee and hand tighten the slip nuts. The connecting arm should slope downwards to the drain tee. After making all the connections tighten the slip nuts with a pair of channel-lock pliers an additional 1/8 of a turn past hand tight. After installing the trap, turn on the water and check around the drain and the trap for leaks. Dishwasher, And End Outlet Drain.